Gastrodiplomacy, how countries conduct cultural diplomacy through promotion of their cuisine, is an increasing popular strategy for public diplomacy and nation branding. 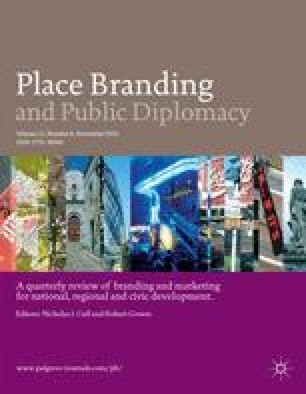 The author examines gastrodiplomacy as a strategy of middle powers trying to create better brand recognition. Numerous middle powers have invested significant capital resources in culinary diplomacy projects to enhance global awareness of their respective cultures as a means to further nation brand status and soft power. This article outlines theoretical distinctions of gastrodiplomacy. It analyzes the strategy and tactics of a variety of gastrodiplomacy campaigns conducted by a range of middle-power states, and examines gastrodiplomacy in the context of people-to-people engagement. Agence France Presse. (2006) Malaysia launches multimillion dollar ‘halal hub’. 11 April, http://www.sawfnews.com/Lifestyle/10354.aspx, accessed 9 February 2012. Alhinnawi, H. (2011) Gastrodiplomacy: Winning hearts through feeding the stomach. USC Center on Public Diplomacy, 17 November, http://uscpublicdiplomacy.org/index.php/newswire/cpdblog_detail/gastrodiplomacy_winning_hearts_through_feeding_the_stomach/, accessed 8 February 2012. Bishop, C. (2010) Malaysian street food celebration takes over the Third Street Promenade. LA Weekly, 10 December, http://blogs.laweekly.com/squidink/2010/12/gs_post_malaysia_street_fair_c.php, accessed 8 February 2012. Booth, R. (2010) Taiwan launches ‘gastrodiplomacy’ drive. The Guardian, 8 August, http://www.guardian.co.uk/world/2010/aug/08/taiwan-launches-gasto-diplomacy-drive, accessed 8 February 2012. Boyes, R. (2010) No more Saumagen experiments – German culinary diplomacy. Goethe Institut, http://www.goethe.de/ges/mol/typ/en6848831.htm, accessed 8 September 2012. Caltonhill, M. (2011) Gastrodiplomacy: Promoting Taiwan through its food. AmCham, Vol. 41, No. 1, http://www.amcham.com.tw/content/view/3138/479/, accessed 8 February 2012. City Eating. (2010) Trafalgar square to host Malaysian Night Market. 19 August, http://blog.city-eating.com/2010/08/trafalgar-square-to-host-malaysian-night-market.html, accessed 8 February 2012. Chang, M. (2012) Beef noodle soup brings taste of Taiwan to US. Taiwan Today, 25 February, http://taiwantoday.tw/ct.asp?xItem=186923&ctNode=413, accessed 21 October 2012. Economist. (2002) Food as ambassador: Thailand's gastro-diplomacy. 21 September, http://www.economist.com/node/999687, accessed 4 February 2012. Edge, J. (2010) The tortilla takes a road trip to Korea. New York Times 27 July, http://www.nytimes.com/2010/07/28/dining/28united.html?_r=3&ref=homepage&src=me&pagewanted=1, accessed 8 February 2012. Flannery, N. (2011) Chopstick diplomacy in Chile. Global Post 9 March, http://www.globalpost.com/dispatch/news/regions/americas/chile/110228/chinese-food-restaurants, accessed 8 February 2012. Gelt, J. (2009) Kogi Korean BBQ, a taco truck brought to you by Twitter. Los Angeles Times, 11 February, http://www.latimes.com/features/la-fo-kogi11-2009feb11,0,4771256.story, accessed 21 October 2012. Holbrook, S. (2007) Taiwanese revolution. Metroactive, 17 October, http://www.metroactive.com/metro/10.17.07/dining-0742.html, accessed 21 October 2012. Information Division, Indonesia Embassy. (2008) At the Embassy of Indonesia, a new tool: Gastro-diplomacy, http://www.embassyofindonesia.org/press/gastrodiplomacy.htm, accessed 9 February 2012. Jakarta Post. (2011) RI envoy to Netherlands to promote culinary diplomacy. 28 December, http://www.thejakartapost.com/news/2011/12/28/ri-envoy-netherlands-promote-culinary-diplomacy.html, accessed 9 February 2012. Kang, H. (2010) First lady's pet project: Food diplomacy. Korea Times 19 October, http://www.koreatimes.co.kr/www/news/nation/2010/10/116_74843.html, accessed 8 February 2012. KBS World. (2011) Popularity of American food growing on East Coast. 7 July, http://rki.kbs.co.kr/english/news/news_Cu_detail.htm?lang=e&id=Cu&No=82839&current_page=20, accessed 20 September 2012. Lesonsky, R. (2010) Hottest food trends 2011. Small Business Trends, 29 December, http://smallbiztrends.com/2010/12/hottest-food-trends-for-2011.html, accessed 21 October 2012. Liu, K. (2011) Bubble tea takes Taiwan to the world. Taiwan Today, 27 May, http://www.taiwantoday.tw/ct.asp?xItem=165731&CtNode=428, accessed 4 February 2012. Moskin, J. (2009) Culinary diplomacy with a side of Kimchi. New York Times 23 September, http://www.nytimes.com/2009/09/23/dining/23kore.html, accessed 4 February 2012. Nicholls, W. (2006) High on Peru. Washington Post 10 May, http://www.washingtonpost.com/wp-dyn/content/article/2006/05/09/AR2006050900337.html, accessed 6 February 2012. Ramstad, E. (2011) Korean Tacos Bounce From LA to Seoul. Wall Street Journal, 21 November, http://blogs.wsj.com/korearealtime/2011/11/21/korean-tacos-bounce-from-la-to-seoul/, accessed 21 October 2012. Rana, Y. (2011) Food diplomacy to check violence against students in Oz. Times of India 5 March, http://timesofindia.indiatimes.com/world/Food-diplomacy-to-check-violence-against-Indians-in-Oz/articleshow/7633323.cms, accessed 7 February 2012. Restaurant Hospitality. (2011) Global trends 2012: Expect more global tastes. 20 October, http://restaurant-hospitality.com/trends/food-trends-2012-global-tastes1011, accessed 21 October 2012. Rockower, P. (2010) Branding Taiwan through gastrodiplomacy. Nation-Branding.info, 7 July, http://nation-branding.info/2010/07/21/branding-taiwan-through-gastrodiplomacy/, accessed 9 February 2012. Rockower, P. (2011) Malaysia jumps on gastrodiplomacy bandwagon. Daily Beast 29 March, http://www.thedailybeast.com/articles/2011/03/29/malaysia-jumps-on-gastrodiplomacy-bandwagon.html, accessed 8 February 2012. Rockower, P. (2012) Setting the table for diplomacy. Huffington Post, 21 September, http://www.huffingtonpost.com/paul-rockower/setting-the-table-for-dip_b_1904521.html, accessed 24 September 2012. Shah, R. (2010) Culinary Diplomacy at the Axis of Evil Cafe. Salon, 9 June, http://www.salon.com/2010/06/09/conflict_kitchen_restaurant/, accessed 21 October 2012. Sunanta, S. (2005) The globalization of Thai Cuisine. Unpublished paper presented at the Canadian Council for Southeast Asian Studies, Toronto, http://www.yorku.ca/ycar/Publications/CCSEAS_Papers_2005/Sunanta.pdf, accessed 9 September 2012. Taiwan Today. (2010a) Cooking a prosperous future. 4 June, http://www.metroactive.com/metro/10.17.07/dining-0742.html, accessed 4 February 2012. Taiwan Today. (2010b) Cabinet passes plan to promote Taiwan's cuisine. 4 June, http://taiwantoday.tw/ct.asp?xItem=1058228ctNode=413, accessed 4 February 2012.
theSqueeze. (2012) Korean food one of the food trends of 2012. 8 May, http://www.thesqueeze.net/All-Categories/Food-Wine/Gourmet/Korean-food-one-of-the-food-trends-of-2012, accessed 21 October 2012. Ulaby, N. (2010) Sea salt latte: Is 85C the next coffee craze. Morning Edition (NPR), 8 June, http://www.npr.org/templates/story/story.php?storyId=127474607, accessed 4 February 2012. U.S. Department of State Diplomatic Culinary Partnership Initiative. (2012) Setting the table for diplomacy, http://www.foodpolitics.com/wp-content/uploads/Diplomatic-Culinary-Partnership-Initiative-One-Pager.pdf, accessed 8 September 2012. Wang, A. (2011) Bubbling up around the world. Taiwan Today, 8 January, http://taiwantoday.tw/ct.asp?xItem=172531&ctNode=124&mp=9, accessed 19 September 2012. Weise, E. (2012) From fancy salt to gourmet trucks. USA Today 18 January, http://www.usatoday.com/news/health/wellness/fitness-food/story/2012-01-17/From-fancy-salt-to-gourmet-trucks-an-appetizing-look-2012/52621708/1, accessed 21 October 2012. Woo, J. (2012) Lessons of the Bibimbap backpackers. Wall Street Journal, 13 January, http://blogs.wsj.com/korearealtime/2012/01/13/lessons-of-the-bibimbap-backpackers/, accessed 7 February 2012. Wu, O. and Liu, H. (2012) Google employees line up for Taiwan's beef noodles. Focus Taiwan, 9 February, http://focustaiwan.tw/ShowNews/WebNews_Detail.aspx?ID=201202090032&Type=aEDU, accessed 15 September 2012.